Annualmente viene prodotta una notevole quantità di pubblicazioni sulla SIDS, che testimoniano l’importanza sociale e scientifica di questa particolare condizione morbosa che tuttora rappresenta, nei paesi industrializzati, la prima causa di morte nel periodo postneonatale. L’ampia produzione scientifica è motivata anche dalla natura multifattoriale della SIDS, il che implica il coinvolgimento di numerose discipline per consentire un approccio globale. Negli ultimi anni l’interesse della comunità scientifica internazionale si è principalmente focalizzato sulle aree tematiche relative ai meccanismi di controllo cardiorespiratorio durante il sonno, allo sviluppo ed alla funzione del sistema nervoso autonomo, alle norme di accudimento ed alla sicurezza durante il sonno dei bambini nei primi mesi di vita, alla genetica ed all’interazione dei fattori di rischio genetici con i fattori di rischio ambientali. Willinger M., James L. S., Catz C., Defining the sudden infant death syndrome (SIDS): deliberations of an expert panel convened by the National Institute of Child Health and Human Development, Pediatr Pathol 1991, 11: 677-84. Krous H. F., Beckwith J. B., Byard R. W., Rognum T. O., Bajanowski T., Corey T., Cutz E., Hanzlick R., Keens T. G., Mitchell E. A., Sudden Infant Death Syndrome and Unclassified Sudden Infant Deaths: A Definitional and Diagnostic Approach, Pediatrics 2004, 114: 234-238. Mitchell E. A., Sleeping position of infants and the sudden infant death syndrome, Acta Paediatr. Suppl. 1993, 389: 26-30. Mitchell E. A., Thompson J. M. D., Co-sleeping increases the risk of SIDS, but sleeping in the parents’ bedroom lowers it, in: Rognum T. O., editor, Sudden infant death syndrome. New trends in the nineties, Oslo, Scandinavian University Press, 1995, 266-9. Blair P. S., Fleming P. J., Smith I. J., et al., Babies sleeping with parents; case-control study of factors influencing the risk of the sudden infant death syndrome, BMJ 1999; 319: 1457-62. Carpenter R. G., Irgens L. M., Blair P. S., England P. D., Fleming P., Huber J., Jorch G., Schreuder P., Sudden unexplained infant death in 20 regions in Europe: case control study, Lancet 2004; 363: 185-91. Chen A., Rogan W. J., Breastfeeding and the risk of postneonatal death in the United States, Pediatrics 2004, 113: 435-9. Spencer N., Logan S., Sudden unexpected death in infancy and socioeconomic status: a systematic review., J Epidemiol Community Health. 2004, 58: 366-73. Tappin D., Ecob R., Brooke H., Bedsharing, roomsharing, and sudden infant death syndrome in Scotland: a case-control study, J Pediatr. 2005; 147: 32-7. Hauck F. R., Omojokun O. O., Siadaty M. S., Do pacifiers reduce the risk of sudden infant death syndrome? A meta-analysis, Pediatrics 2005, 116: 716-23. Mitchell E. A., Blair P. S., L’Hoir M. P., Should pacifiers be recommended to prevent sudden infant death syndrome?, Pediatrics 2006, 117: 1755-8. Mitchell E. A., Milerad J., Smoking and the sudden infant death syndrome, Rev. Environ Health 2006, 21: 81-103. Vennemann M. M., Butterfass-Bahloul T., Jorch G., Brinkmann B., Findeisen M., Sauerland C., Bajanowski T., Mitchell E. A., The GeSID group, Sudden infant death syndrome: No increased risk after immunisation, Vaccine 2006. Guntheroth W. G., Lohmann R., Spiers P. S, Risk for sudden infant death syndrome in subsequent siblings, J Pediatr. 1990, 116: 520-4. Malloy M. H., Hoffman H. I., Prematurity, sudden infant death syndrome, and age of death, Pediatrics 1995; 96: 464-71. Oyen N., Skjaerven R., Irgens L. M., Population-based recurrence risk of sudden infant death syndrome compared with other infant and fetal deaths, Am J Epidemiol 1996, 144: 300-5. Schwartz P. J., Stramba-Badiale M., Segantini A., Austoni P., Bosi G., Giorgetti R., Grancini F., Marni E. D., Perticone F., Rosti D., Salice P., Prolongation of the QT interval and the sudden infant death syndrome, N Engl J Med 1998, 338: 1709-14. Malloy M. H., Freeman D. H., Birth weight-and gestational age-specific sudden infant death syndrome mortality: United States, 1991 versus 1995, Pediatrics 2000, 105: 1227-31. Carpenter R. G., Waite A., Coombs R. C., Daman-Willems C., McKenzie A., Huber J., Emery J. L., Repeat sudden unexpected and unexplained infant deaths: natural or unnatural?, Lancet 2005, 365: 29-35. Pickett K. E., Luo Y. L.D., Widening social inequalities in risk for sudden infant death syndrome, Am J Public Health 2005, 95: 1976-81. Thompson M. W., Hunt C.E., Control of breathing: development, apnea of prematurity, apparent life-threatening events, SIDS, in: MacDonald M. G., Mullett M. D., Seshia M. M. K. editors, Avery’s neonatology: pathophysiology and management of the newborn, 6th ed. Philadelphia: Lippincott Williams & Wilkins 2005, 535-52. Mitchell E. A., The changing epidemiology of SIDS following the national risk reduction campaigns, Pediatr. Pulmonol Suppl. 1997, 16:117-9. Duggan A., Jarvis J., Derauf D. C., Aligne C. A., Kaczorowski J., The essential role of research in community pediatrics, Pediatrics 2005, 115:1195-201. The Changing Concept of Sudden Infant Death Syndrome: Diagnostic Coding Shifts, Controversies Regarding the Sleeping Environment, and New Variables to Consider in Reducing Risk. Task Force on Sudden Infant Death Syndrome, Pediatrics 2005, 116: 1245-1255. Kahn A., European Society for the Study and Prevention of Infant Death. Recommended clinical evaluation of infants with an apparent life-threatening event. 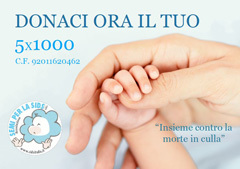 Consensus document of the European Society for the Study and Prevention of Infant Death, Eur J Pediatr. 2004, 163:108-15. Brand D. A., Altman R. L., Purtill K., Edwards K. S., Yield of diagnostic testing in infants who have had an apparent life-threatening event, Pediatrics 2005, 115:885-93. Dewolfe C. C., Apparent life-threatening event: a review, Pediatr. Clin. North Am. 2005, 524:1127-46. Ramanathan R., Corwin M. J., Hunt C. E., Lister G., Tinsley L. R., Baird T., Silvestri J. M., Crowell D. H., Hufford D., Martin R. J., Neuman M. R., Weese-Mayer D. E., Cupples L. A., Peucker M., Willinger M., Keens T. G., Collaborative Home Infant Monitoring Evaluation (CHIME) Study Group. Cardiorespiratory events recorded on home monitors: Comparison of healthy infants with those at increased risk for SIDS, JAMA 2001, 285: 2199-207. Committee on Fetus and Newborn. American Academy of Pediatrics. Apnea, sudden infant death syndrome, and home monitoring, Pediatrics 2003, 111:914-7. Sridhar R., Thach B. T., Kelly D. H., Henslee J. A., Characterization of successful and failed autoresuscitation in human infants, including those dying of SIDS, Pediatr. Pulmonol. 2003, 36:113-22. Spitzer A. R., Current controversies in the pathophysiology and prevention of sudden infant death syndrome, Curr. Opin. Pediatr. 2005, 17:181-5. Piumelli R. and the Italian Interhospital Network of Telemonitoring, Data transmission and analysis in documented monitoring, in: Proceedings of the 9th SIDS International Conference, Yokohama June 1-4, 2006, pp. 40-41. Thach B.T., The role of respiratory control disorders in SIDS, Respir. Physiol. Neurobiol 2005, 149:343-53. Kato I., Scaillet S., Groswasser J., Montemitro E., Togari H., Lin J. S., Kahn A., Franco P., Spontaneous arousability in prone and supine position in healthy infants, Sleep. 2006, 29:785-90. Mandell F, McClain M, Reece RM. Sudden and unexpected death. The pediatrician’s response. Am J Dis Child 1987;141:748 -750. Goldberg J. The counseling of SIDS parents. Clin. Perinatol.1992;19:927-38. Vance JC, Najman JM, Thearle MJ, Embelton G, Foster WJ, Boyle FM. Psychological changes in parents eight months after the loss of an infant from stillbirth, neonatal death, or sudden infant death syndrome-a longitudinal study. Pediatrics 1995; 96:933-8. Di Fabio A. Il Counseling sanitario. In: Counseling. Dalla teoria all’applicazione. Giunti Ed.1999: p. 277-284. McDonnell M, Cullen A, Kiderb B, Mehanni M, Matthews T. A National model of care serve for professional dealing with sudden in death. Ir J Med Sci. 1999;168:237-41. Nelson J, Horchler J. SIDS and Infant Death Survival Guide: information and comfort for grieving family and friends and professionals who seek to help them. Paperback 2003.